We, Muriel and Adrian, have been gardening as neighbors for over twenty years and had never seen hummingbirds in our back yards. In 2008 Muriel decided to see if she could attract them. She put out two feeders, and amazingly, a pair showed up during the fall migration period, staying around for several weeks before continuing south. We decided it was in part the feeders, but also because we have many hummingbird attracting flowers in our yards and don’t use insecticides. In 2009 we started this project and several neighbors joined, also putting up feeders and planting appropriate flowers. The hummers returned that fall. In 2010 we enlisted even more neighbors and to help make our block a real haven for these beautiful birds. Who knows how many hummingbirds might decide to stop by on their way north or south, or even stick around to build nests and raise young? 2015 update: we've been seeing hummers since early spring and all summer long. Put out a hummingbird feeder and keep it filled with sugar water (this requires a certain degree of commitment, since it must be cleaned and refilled weekly). Don't use insecticides in your yard. Besides pests, they can also be toxic to people, bees, butterflies, and birds. 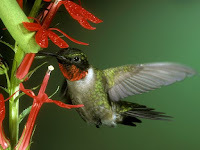 Flowers and feeders attract hummers because, as one source put it, “hummers need nectar to power the bug eating machines that they are.” Most of their diet is soft-bodied insects and spiders. Having hummers around helps improve the balance of nature.